There may not be a more disgusting and less useful bird on this planet than the European Starling. Ugh! What are they good for? They aren’t particularly colorful. Their normal “song” sounds like a bearing going out on a push mower. They love to build nests in inconvenient places, and not just petite, nearly unnoticeable structures. Ever seen what looks like a half a bale of hay sticking out of a rain gutter? Probably a starling nest. And they are an invasive species! From Europe. Probably not the civilized, crepe suzette or Charles Dickens part of Europe, either. More likely from the part that produced vampires, world wars and iron fisted despots. My guess is now there are starlings everywhere from the Arctic to the Antarctic, from the mountains of Nepal to the Okefenokee Swamp. Probably all building hay bale sized nests in rain gutters and martin houses where ever they live. But sitting in my car recently while Peggy hurried in for a last minute shopping excursion, I enjoyed a natural wonder that starlings do better than any other species. They murmur. A starling murmur isn’t a bunch of them sitting around speaking in a guteral lower European language. It’s a few hundred of them, perhaps a few thousand, perhaps even more, flocking together and exhibiting an aerial display that makes the Navy’s Blue Angel flight team look like rank amateurs. This huge conglomeration of birds, fly in an amorphous flock in absolute synchrony. The shape of the flock, the height of the flock, the direction of the birds, flows like a million-bird living lava lamp. It’s absolutely spectacular and not all that hard to see. Just watch for a flock over a field, forest or community near you, then pause and enjoy the show. And enjoyment, it must be. There’s no reason for a starling flock to form a murmuration other than for the pure fun of it. Like human’s dancing or shouting Dee-Fence in unison at football games; like antelope racing across the prairie just because they can. Animals live to stay warm, well fed and produce enough offspring to keep their species prosperous. Whether the animal is a field mouse or an elephant. Some animals work their tails off to accomplish these three things. Others, do it quite easily and then spend some of the rest of their days enjoying life. Hippos take a swim. Lions sunbathe. Evidently, starlings murmur. Watch for it. 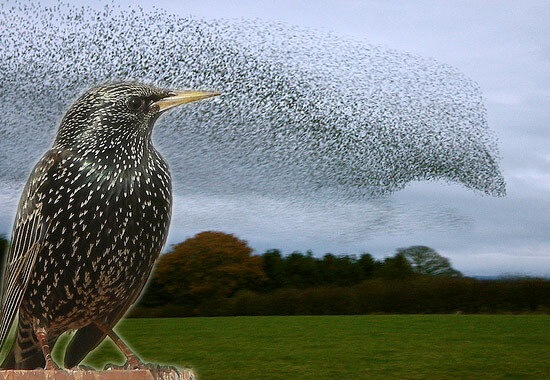 There’s likely a starling murmuration going on near you today, tomorrow, where ever, whenever you are outdoors. They almost make pulling those hay bales out the gutters worthwhile.